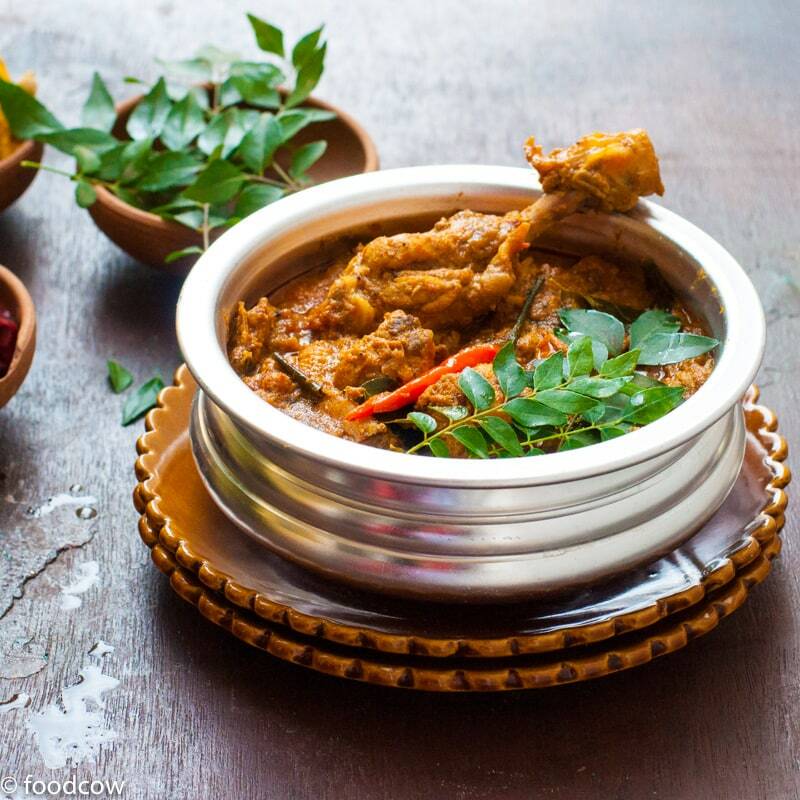 This is an Everyday South Indian Chicken Curry, as the name suggests, made simply but with the full of flavour from freshly roasted spices, fresh coconut and curry leaves. This is that Quintessential South Indian chicken curry that you would want to eat on a calm quiet day with a side of freshly made dosas or a bowl of steaming rice..just sitting with your family and enjoying simple food. I usually make a big pot of this and serve it for next three meals- First with plain boiled rice and papad ,then in the morning for breakfast with freshly made homemade dosas and then the leftover with some khichadi or bisibela bhath.My husband and now my son, looove this recipe! The last time I made this curry, my son, a whole of 20 months old, sat on his father’s lap and ate the chicken while making faces because of the spices but didn’t stop eating it. I can totally imagine this will be my “family” recipe.Something my son, Vansh, will grow up eating and crave when he is away from home.This would be the “Maa ka Khana” he will miss when he doesn’t get homecooked food. The chicken is flavoured with a blend of warm spices where cinnamon and star anise are the main heroes.The curry is thickened with ground, roasted fresh coconut scrapings and khas khas(poppy seeds).This, rather than the onions and tomatoes make for the bulk of gravy and sauce. The acid used is tamarind- although lime juice and Kokum will also work very well.The curry leaves add the umami and savoryness to the curry- making it wholly South Indian with it’s use. Dry roast the fresh coconut first on medium flame.When it turns golden brown add the red chillies, poppy seeds, cloves, coriander seeds, cinnamon sticks, black pepper, cardamom and star anise.Add the Ginger and garlic cloves.Roast for 5 minutes on medium heat. Remove from the heat. Let it cool and grind it all together with a splash of water. Heat the oil in a deep pot.Add the onions and cook till they start turning golden brown. Add the curry leaves and the masala paste.Cook for 10 minutes till the masala starts to darken. Add the chopped up tomatoes,salt and cook for another 10 minutes. Once the tomatoes are mushy, add the chicken to the pot.Add 1/2 cup water.Cover and cook for 20 minutes. Adjust the salt, squish and add the tamarind along with the water. Cook for another 10 minutes on low heat. The curry is mildly spicy.Increase the amount of black pepper while making the masala paste to make it more spicy. Some more amazing indian curries from my blog.